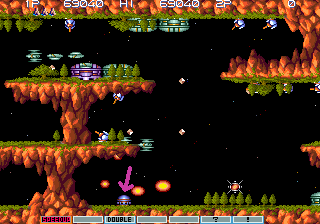 On Stage 3 you can start a hidden stage theme by destroying the purple base at the bottom of the screen. 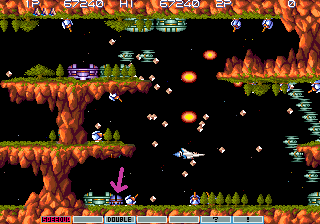 To play the first stage of Gradius and Salamander, play Gradius III until you get to the end of game final boss, he shoots three electric balls at you, don't dodge them, touch the middle ball to warp into Gradius world or touch the lower one to warp into Salamander world. Turn Odd Number Dip Switches except Dip 1-5 AFTER boot up. In game, hold Service Switch (Coin 3 = Key 7 in Mame) then press 1P Start Button. On the Power Meter Select screen. Up, Up, Down, Down, Left, Right, Left, Right, Button-2 (Shot), Button-3 (Missile).